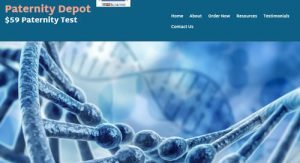 Top 10 DNA Tests - Is Paternity Depot Legit? We always strive to give our articles a scientific, yet comprehensive tone before anything else. We’re also highly dedicated to maintaining contact with our readers and answering all their potential questions about any segment of the best DNA testing services out there. The most frequent inquiries we‘ve received lately are about the legitimacy of Paternity Depot’s service, relaying the general concern for the looming possibility of a scamming operation. If you too are attracted by the company’s low pricing policy but aren’t quite sure what to make of Paternity Depot itself, read this explanation and find out whether the low prices are worth the trouble or not. Paternity Depot is your traditional direct-to-customer provider of relationship DNA testing. Its portfolio includes paternity, sibling, avuncular, and maternity tests. You can pay extra for additional testing subjects or if you want to use discreet samples. Discreet sampling refers to pretty much any source of genetic material including blood, chewing gums, dental floss, toothpicks, nail clippings, toothbrush, bones or teeth, urine, cigarette butts, and more. This practice is the source of our first concern with Paternity Depot. The official site never claims the test subject needs to be informed of the procedure using his/her DNA. Theoretically, you can test people for genetic relationships without them even knowing about it, as long as you can obtain their DNA. When it comes to the average turnaround times, the site tells us two different things at two different places. The first page claims a 7-day waiting period, the second shortens that to 3-5 days. Luckily, you can always contact user support by phone or email and get your answers there. The site claims the company was founded in Toronto and, indeed, a certain Harvey Tenenbaum from Toronto is listed as the domain registrant. On the other hand, Paternity Depot’s website is not protected with SSL technology, which could potentially put your personal information and payment details into jeopardy. The site claims that Paternity Depot exists for more than a decade, but the company’s domain name was first registered in 2014. This is not a surefire proof of anything underhanded, but it definitely doesn’t help. Users who ordered some of Paternity Depot tests relayed mixed experiences. Some were very happy with the company and its service and others were rather disappointed. In other words, Paternity Depot is somewhat of a hit-and-miss when it comes to delivering on its promises. Paternity Depot is not a scam, but the team definitely implemented some shady tactics to present the company in a better light than it deserves. The end product looks and feels unprofessional at best and the team has a lot of work to do if they want to compete with prominent DNA testing providers. On the other hand, the pricing policy is probably the budget-friendliest you’ll ever see, so it just might be worth the risk.